Looking for a sweet deal at Steak and Shake? Consider grubbing during Steak and Shake Happy Hours! Steak n Shake Happy Hour is one of my favorite ways to save throughout the week when we're eating out as a family as some of the Steak n Shake specials are too good to pass up. Steak and Shake happy hour offers several deals and specials that we'll be going over below as well as Steak n Shake happy hour times and days of the week, happy hour milkshake deals and more. For those that don't know, happy hour at Steak and Shake is freaking awesome! Not only are the prices great, but the times are reasonable and the milkshakes are incredible. What Time Is Steak n Shake Happy Hour? Steak and Shake Happy hour is weekdays from 2-5 p.m. and also 2-5 a.m.
One of the best things about Steak & Shake Happy Hour is the times it's available. 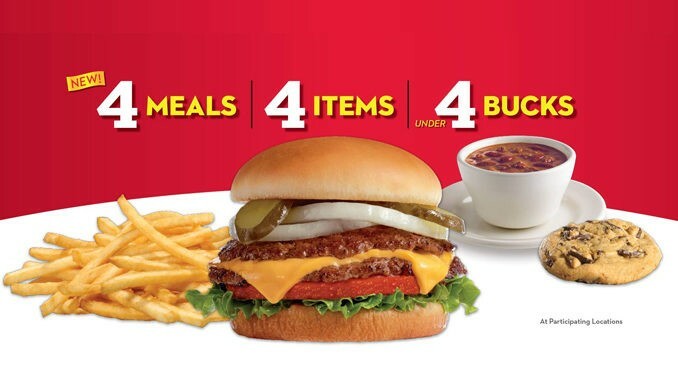 In previous years the promotion ended at 4 p.m. but in recent years the promotion has been offered from 2-5 p.m. which makes it much easier for us to plan our trips to Steak & Shake. To double check your store's Happy Hour hours, go to the Steak and Shake homepage and in the top right corner enter your zip code to see your stores hours. What Milkshakes Half Off During Happy Hour? Yes milkshakes are half off during Happy Hour at Steak and Shake! Before you go to Steak and Shake you'll want a quick rundown of the best deals and specials. The 4 for $4 Happy Hour deal is one of the most popular. With this deal you get a burger or chicken fingers with fries, another side and a cookie plus you get to pick one additional side too! 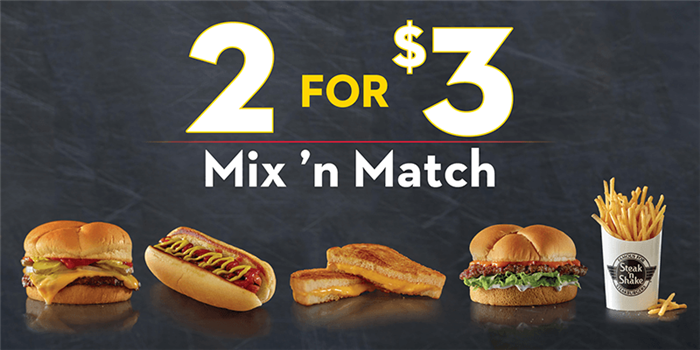 Did you go with the 2 for $3 or the 4 for $4 deal and now you need to grab a drink? No worries, there are a bunch of options to choose from on the Steak and Shake happy hour drink menu. What and When Is Steak n Shake Late Night? The best part about Steak n Shake Happy Hour is late night Happy Hour! Not only can you score Steak and Shake food specials during the day but you can also go to late night Happy Hour which is Monday through Friday from 2 to 5 a.m. The best part? The same Happy Hour menu as we've shared above is available during these hours. Is Steak n Shake Happy Hour On Weekends? Unfortunately no, there is no Happy Hour on weekends at Steak & Shake. For my family, we're always looking forward to our milkshake trips at Steak and Shake. We're hoping they'll add happy hour to weekends soon, but for now no dice. For now you'll have to go with late night happy hour during the week or go during regular hours. There are plenty of other great perks to the Steak & Shake Happy Hour so we figured we breakdown some handy tips to help you save even more (time and money). Take advantage of ordering online: It's an easy way to save a little bit of time, we usually do this during the time of year where we know it'll just be packed, makes for quick grabbing. Sign up for the Steak & Shake Rewards Program: Don't look past signing up for the Steak & Shake rewards program. It's free to sign up and you'll get some sweet freebies! Download the Steak & Shake app: By downloading the Steak & Shake app, you can have it all in one spot. Keep track of your rewards points or order online with one click. You'll also be the first to know about promo codes, coupons and deals they've got going on too. Your turn: What are your thoughts on Steak & Shake's Happy Hour? If so what's your favorite Shake or Drink? We'd love to hear!